. 47.6 × 66 cm (18.7 × 25.9 ″). New York City, Metropolitan Museum of Art. Portrait of a Man. Technique unknown. 67 × 56 cm (26.3 × 22 ″). Lviv, Lviv National Art Gallery.
. 1617. Black and red chalk. 38.4 × 23.5 cm (15.1 × 9.2 ″). Los Angeles, J. Paul Getty Museum.
. Red and black chalk, heightened with white. 16 × 13 cm (6.2 × 5.1 ″). New York City, Sotheby's ( 25 January 2012 ).
. 70 × 53.5 cm (27.5 × 21 ″). Mexico City, Museo Soumaya.
. 64.8 × 50.8 cm (25.5 × 20 ″). San Diego, Timken Museum of Art.
. 82.6 × 66 cm (32.5 × 25.9 ″). New York City, Sotheby's ( 28 January 2000 ).
. 48.7 × 40 cm (19.1 × 15.7 ″). Vienna, Kunsthistorisches Museum.
. 105 × 74 cm (41.3 × 29.1 ″). Vienna, Kunsthistorisches Museum.
. 122 × 89 cm (48 × 35 ″). London, National Gallery .
. 200 × 119 cm (78.7 × 46.8 ″). São Paulo, Museu de Arte de São Paulo.
. 119 × 86 cm (46.8 × 33.8 ″). Antwerp, Rubenshuis.
. 103.4 × 78.4 cm (40.7 × 30.8 ″). Amsterdam, Christie's ( 9 November 2010 ).
. 112 × 173 cm (44 × 68.1 ″). Madrid, Prado Museum. label QS:Len,"Cardinal-Infante Fernando de Austria at the Battle of Nördlingen"
label QS:Lnl,"Kardinaal-infant Ferdinand van Oostenrijk tijdens de slag van Nördlingen"
label QS:Lpl,"Kardynał-infant Ferdynand podczas bitwy pod Nördlingen"
. 337.5 × 261 cm (132.8 × 102.7 ″). Madrid, Prado Museum.
. 116.5 × 85 cm (45.8 × 33.4 ″). Prague, National Gallery in Prague.
. 117.8 × 85.1 cm (46.3 × 33.5 ″). Saint Louis, Saint Louis Art Museum.
. 114.2 × 91.9 cm (44.9 × 36.1 ″). Amsterdam, Sotheby's ( 17 December 2008 ).
. 122.2 × 102.1 cm (48.1 × 40.1 ″). Boston, Isabella Stewart Gardner Museum.
. 67 × 54 cm (26.3 × 21.2 ″). London, National Gallery .
. 63 × 48 cm (24.8 × 18.8 ″). Florence, Palazzo Pitti. 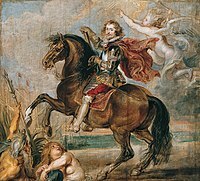 label QS:Len,"Equestrian portrait of George Villiers, 1st Duke of Buckingham"
label QS:Lnl,"Ruiterportret van George Villiers, 1st Duke of Buckingham"
label QS:Lpl,"Portret konny Jerzego Villiers, 1. księcia Buckingham"
. 44.5 × 49.2 cm (17.5 × 19.3 ″). Fort Worth, Texas, Kimbell Art Museum.
. 118.5 × 102 cm (46.6 × 40.1 ″). Vienna, Kunsthistorisches Museum.
. 63 × 49 cm (24.8 × 19.2 ″). Antwerp, Museum Plantin-Moretus.
. 63.5 × 48.5 cm (25 × 19 ″). Antwerp, Museum Plantin-Moretus. label QS:Lde,"Allegorie auf Kaiser Karl V. als Weltenherrscher"
label QS:Len,"Allegory on Emperor Charles as Ruler of Vast Realms"
label QS:Lnl,"Allegorie op Karel V als wereldheerser"
label QS:Lpl,"Alegoria cesarza Karola V jako władcy rozległych posiadłości"
. 166.5 × 141 cm (65.5 × 55.5 ″). Salzburg, Residenzgalerie Salzburg.
. 75 × 55.5 cm (29.5 × 21.8 ″). London, Courtauld Gallery.
. 81.2 × 56.5 cm (31.9 × 22.2 ″). New York City, Christie's ( 26 January 2011 ). Portrait of the Duke of Lerma. 1603. Black chalk, pen in brown, brown wash. 29 × 21.5 cm (11.4 × 8.4 ″). Paris, Louvre Museum. label QS:Lde,"Reiterporträt des Herzogs von Lerma"
label QS:Len,"Equestrian Portrait of the Duke of Lerma"
label QS:Lnl,"Ruiterportret van de hertog van Lerma"
label QS:Lpl,"Portret konny księcia Lermy"
. 290.5 × 207.5 cm (114.3 × 81.6 ″). Madrid, Prado Museum.
. 65.6 × 50.2 cm (25.8 × 19.7 ″). Antwerp, Museum Plantin-Moretus.
. 66.2 × 51.3 cm (26 × 20.1 ″). Antwerp, Museum Plantin-Moretus. Portrait of Lorenzo de' Medici. 1620-1630. Red chalk, pen and brush in dark brown, wash on paper. 13 × 11.9 cm (5.1 × 4.6 ″). Wrocław, Ossolineum.
. 247 × 116 cm (97.2 × 45.6 ″). Paris, Louvre Museum.
. 118.1 × 96.5 cm (46.4 × 37.9 ″). Pasadena, Norton Simon Museum.
. 4.5 × 3.8 cm (1.7 × 1.4 ″). Amsterdam, Rijksmuseum Amsterdam.
. 140.5 × 101.5 cm (55.3 × 39.9 ″). Vienna, Kunsthistorisches Museum.
. 99.7 × 71.5 cm (39.2 × 28.1 ″). Boston, Museum of Fine Arts, Boston.
. 251 × 237 cm (98.8 × 93.3 ″). Madrid, Prado Museum.
. 114 × 83 cm (44.8 × 32.6 ″). Saint Petersburg, Hermitage Museum.
. 112 × 84 cm (44 × 33 ″). Munich, Alte Pinakothek. label QS:Lde,"Bildnis Philipps IV. von Spanien zu Pferde"
label QS:Len,"Equestrian portrait of Philip IV of Spain"
label QS:Lnl,"Ruiterportret van Philips IV van Spanje"
label QS:Lpl,"Portret konny Filipa IV"
. 337 × 263 cm (132.6 × 103.5 ″). Florence, Uffizi Gallery.
. 63.8 × 49.3 cm (25.1 × 19.4 ″). Antwerp, Museum Plantin-Moretus.
. 63 × 48.5 cm (24.8 × 19 ″). Antwerp, Museum Plantin-Moretus.
. 111.5 × 82.5 cm (43.8 × 32.4 ″). 's-Hertogenbosch, Noordbrabants Museum.
. 99.5 × 74.5 cm (39.1 × 29.3 ″). Maastricht, Bonnefantenmuseum. label QS:Len,"Head of a Franciscan monk"
label QS:Lnl,"Portret van een Franciscaanse monnik"
. 52 × 44 cm (20.4 × 17.3 ″). Saint Petersburg, Hermitage Museum.
. Rotterdam, Museum Boijmans Van Beuningen.
. 66.4 × 51 cm (26.1 × 20 ″). Antwerp, Museum Plantin-Moretus.
. 167 × 143 cm (65.7 × 56.2 ″). Florence, Palazzo Pitti.
. 66 × 50.9 cm (25.9 × 20 ″). Antwerp, Museum Plantin-Moretus.
. 65.9 × 50.7 cm (25.9 × 19.9 ″). Antwerp, Museum Plantin-Moretus.
. 58 × 73 cm (22.8 × 28.7 ″). Antwerp, Museum Rockoxhuis.
. 67 × 51.5 cm (26.3 × 20.2 ″). Vienna, Kunsthistorisches Museum.
. 121 × 91 cm (47.6 × 35.8 ″). Kreuzlingen, Heinz Kisters Collection.
. Kraków, Wawel Royal Castle.
. 266 × 184 cm (104.7 × 72.4 ″). Stockholm, Nationalmuseum.
. 262 × 188.5 cm (103.1 × 74.2 ″). Kraków, Wawel Royal Castle.
. 63.6 × 48.2 cm (25 × 18.9 ″). London, Sotheby's ( 21 March 2007 ).
. 119 × 98 cm (46.8 × 38.5 ″). Antwerp, Royal Museum of Fine Arts Antwerp.
. 206.5 × 120.2 cm (81.2 × 47.3 ″). Kassel, Gemäldegalerie Alte Meister. label QS:Len,"Robin, the dwarf of the Earl of Arundel"
label QS:Lnl,"Robin, de dwerg van de graaf van Arundel"
label QS:Lpl,"Robin, karzeł earla Arundel"
. 1620. Black, red and white chalk, pen in brownish black on paper. 40.8 × 25.8 cm (16 × 10.1 ″). Stockholm, Nationalmuseum.
. drawing. 22.8 × 20 cm (8.9 × 7.8 ″). Vienna, Graphische Sammlung Albertina.
. 50.8 × 40.5 cm (20 × 15.9 ″). Berlin, Gemäldegalerie. label QS:Lde,"Nicolaas Rubens mit Korallenschnur"
label QS:Len,"Nicolaas Rubens with coral necklace"
label QS:Lnl,"Nicolaas Rubens met koraalketting"
label QS:Lpl,"Mikołaj Rubens w koralowym naszyjniku"
. Black chalk, sanguine, heightened in white chalk. Vienna, Albertina.
. drawing. Vienna, Graphische Sammlung Albertina. Portrait of Nicolaas Rubens. 1625-1626. drawing. 29.2 × 20 cm (11.4 × 7.8 ″). Vienna, Graphische Sammlung Albertina.
. Oil and black chalk, gray wash, on paper. 31.1 × 21.8 cm (12.2 × 8.5 ″). London, British Museum.
. 121.9 × 99.7 cm (47.9 × 39.2 ″). London, National Portrait Gallery.
. 64.8 × 49.2 cm (25.5 × 19.3 ″). Antwerp, Museum Plantin-Moretus. This page was last edited on 2 January 2019, at 16:06.